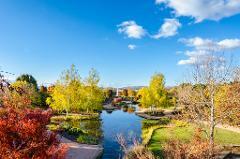 Mayfield Garden is 20 hectares (49 acres) and the design has been inspired by the best gardens throughout Europe. 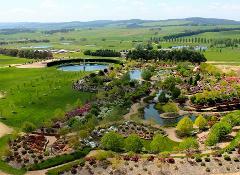 The main features include the 2.5 hectare Water Garden, the Bluestone Bridge, the Grotto & the Copper Tree Fountain. The Hawkins' Family Garden, is a private garden area, which extends beyond Mayfield Garden - 20 hectares (49 acres), an additional 55 hectares (136 acres). It is inspired by the best garden throughout Europe. The Hawkins' Garden, is a private garden area, which extends beyond Mayfield Garden - 20 hectares (49 acres), an additional 55 hectares (136 acres). 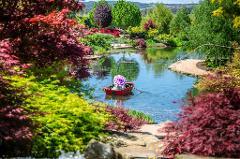 It is inspired by the best gardens throughout Europe. The Hawkins' Family Garden, is a private garden area, which extends beyond Mayfield Garden - 20 hectares (49 acres), an additional 16 hectares (40 acres) of the Private Garden will be available to explore! The Hawkins' Family Garden, is a private garden area, which extends beyond Mayfield Garden - 20 hectares (49 acres), an additional 16 hectares (40 acres) of the private garden will be available to explore in Summer!